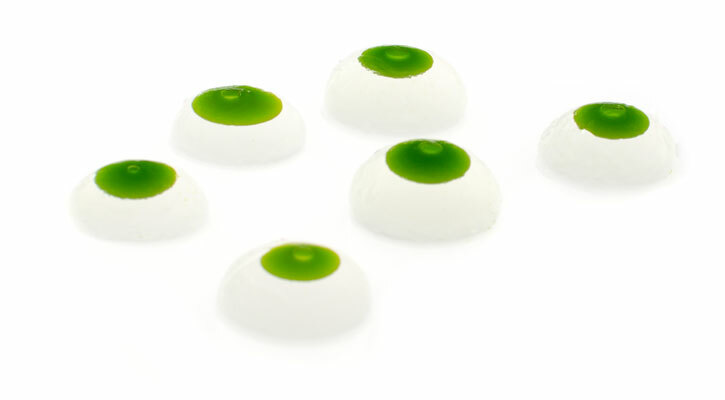 Expand the possibilities of spherification! Have you already mastered basic and reverse spherification? 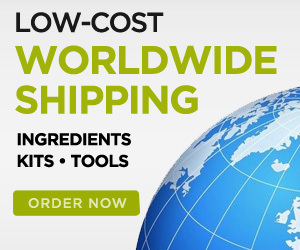 Ready to try something new? Why not inject a flavored oil inside the spheres for a stunning presentation and extra flavor? The beautiful and delicious clear tomato water spheres have a suspended drop of basil oil inside. 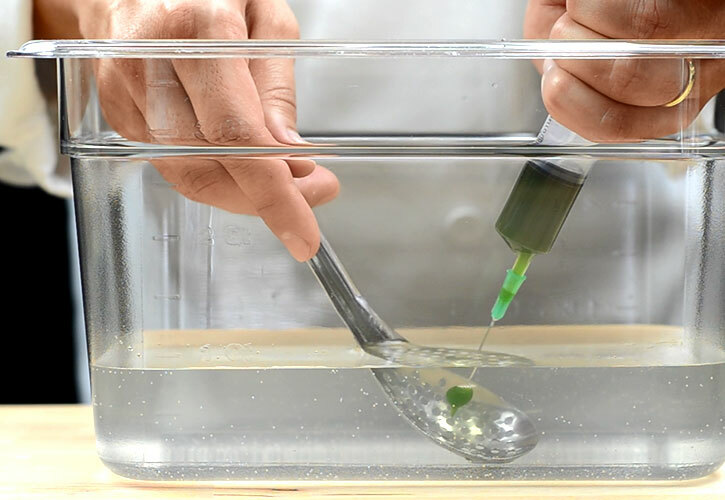 You can do this by carefully injecting the oil into the sphere using a syringe while the sphere is submerged in the alginate bath. After you remove the needle, just leave the sphere for a few extra seconds in the bath so the needle hole seals as gel forms again. Watch the video below! We used frozen reverse spherification in this case because it is usually easier and faster, but for this recipe it requires to go through the alginate bath step twice since you need the inside to melt before injecting the oil. Placing the spheres again in the alginate bath may sometimes cause a non-uniform surface so I think next time I will use the traditional reverse spherification method. We made the tomato water using the cryofiltration technique we explained last week. After all that waiting to obtain a crystal clear tomato water you don't want to make it cloudy when thickening it with xanthan gum. So make sure you use our high quality xanthan gum and prevent the formation of bubbles or eliminate them before making the spheres. To prevent the formation of bubbles, this time we tried using a small magnetic stirrer and we really liked the results. 1- In a medium pot, bring 1 l (34 oz) water and 40 g (1.4 oz) salt to boil. 2- Fill a large bowl with water and ice to cool the basil after blanching. 3- Place the basil in the boiling water for 5 seconds. 5- Blend the blanched basil with the olive oil. Season with salt as necessary. 6- Pass the mixture through a fine sieve lined with cheesecloth. 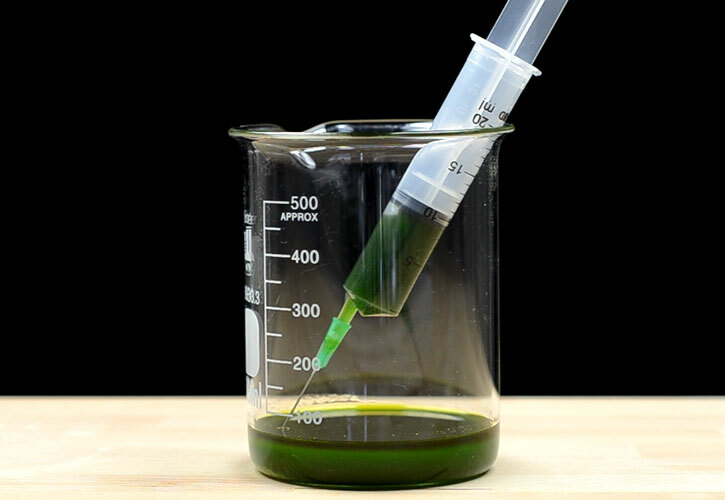 7- Fill a syringe with thin needle with basil oil. 1- Peel tomatoes and remove seeds. To peel tomatoes remove the stem and carefully make a couple of cuts to the skin originating from the end where you removed the stem. Place them in boiling water for 10 to 15 seconds and transfer them to a recipient with ice cold water. Wait for a couple of minutes and then you should be able to peel the skin very easily. 2- Cut the tomatoes in small pieces and blend. 3- Place the tomato puree in a flat container in the freezer. 4- Line a perforated steam table pan with 4 layers of cheesecloth and place it inside a non-perforated steam table pan of the same size. 5- Remove the frozen tomato puree from container, place it over the cheesecloth and store it in the fridge for 24 hours. 6- Collect the clear tomato water from the bottom steam table pan. 1- Measure 300g of tomato water, keep the rest for storing the spheres. 2- Blend the calcium lactate gluconate and xanthan gum with the 300g of tomato water. To prevent the creation of air bubbles and maintain the clarity of the tomato juice, we prefer to use a magnetic stirrer to do this. Slowly sprinkle small portions of the powders on the surface of the spinning liquid and wait until it is completely dispersed before adding more. However, you can use a regular immersion blender and then let it rest in the refrigerator to remove the air bubbles. 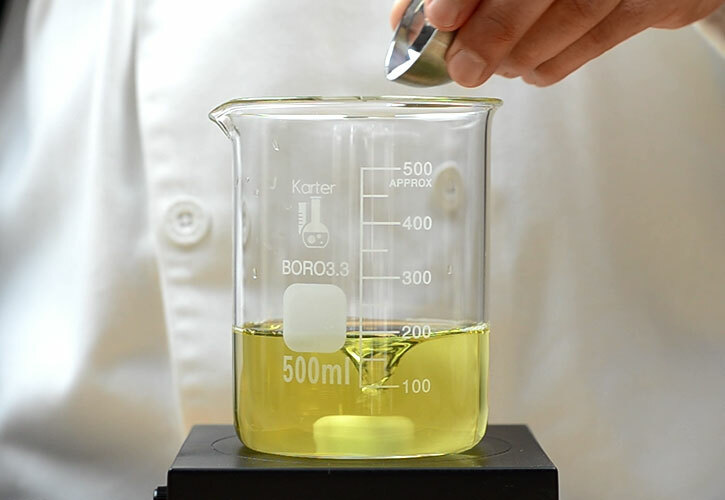 Using the latter method the end result may not be as clear as when using a magnetic stirrer. 3- Place hemispheric silicone mold on a cutting board, flat pan or plate so you can keep it flat while you place it in the freezer. Fill the hemispheric mold with the tomato water and let it freeze overnight. 1- Mix the sodium alginate with the distilled water using a blender until the sodium alginate is completely dissolved. If this is your first time doing this, be aware that it may take longer than expected. 2- Strain the mix and store it in the fridge covered in plastic wrap overnight to eliminate the air bubbles. 1- You are now ready to start the spherification process! Warm the alginate bath in the microwave (around 65 °C / 150 °F). 2- Pop a few frozen tomato water hemispheres into the warm alginate bath. It is important that they don’t touch or they will stick to each other. A flat bottomed container will make it easier when “cooking” multiple spheres. 3- Leave the spheres "cooking" for about 2 minutes in the alginate bath. Try with one sphere first until you find the right timing which depends on how fast the frozen hemisphere thaws. If the membrane is too weak, leave it a little longer in the bath. If it is too thick, reduce the time. After you practice with a few spheres, you’ll be able to tell if they are ready by just lifting the spheres just above the surface of the bath using a slotted spoon. 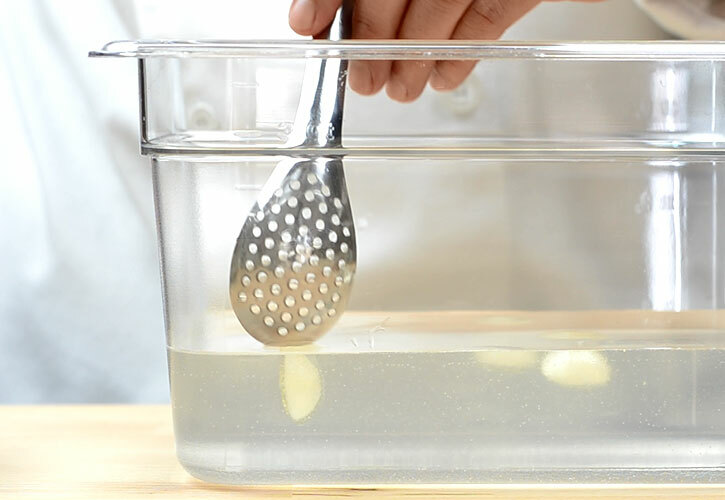 4- Carefully remove the tomato water spheres using a slotted spoon. 5- Rinse them very gently in a bowl with warm water. 6- Once the inside of the spheres is thawed, remove one sphere at a time using a perforated spoon and drain all the water. Use a paper towel to absorb all the water. 7- Immerse the sphere in the alginate bath one more time and with the aid of the perforated spoon, hold it while you inject it with basil oil using the syringe. 8- Wait about 20 seconds to let the needle hole seal in the water bath. 9- Rinse the sphere in the water bath. 10- Transfer the sphere to a container with tomato water while you make more spheres. 11- Store the spheres in the fridge until serving time. One of the biggest benefits of Reverse Spherification is that you can store the spheres to be consumed later. If you leave the spheres in contact with air, the gel will start to dry and eventually break. You need to store them in a liquid bath. 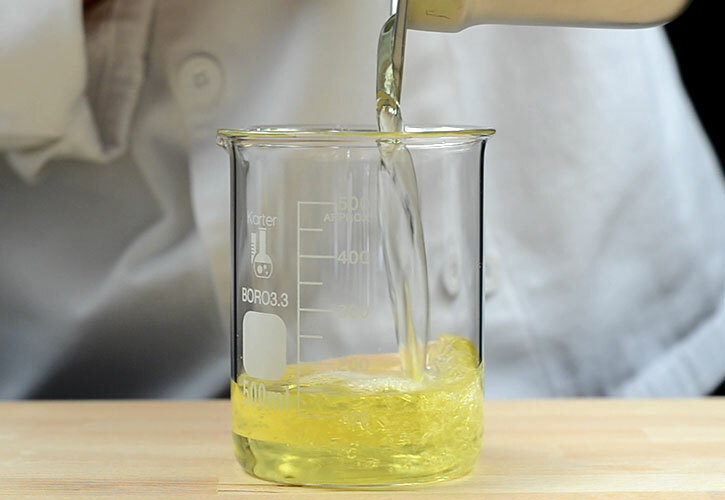 However, since the gel membrane around the sphere is permeable to small molecules, osmosis will occur if submerged in water and dilute the flavored liquid inside the sphere. To preserve the flavor, store them in a bath of the same flavored liquid in the fridge, tomato water in this case. 1- Place the tomato water spheres with basil oil on appetizer spoons. 2- Sprinkle with sea salt flakes.